Good job, “Tips” section! Using canned beans was much easier than the preparation method shown on the card. From the prominently featured bell peppers in the photo, I felt like I had to use bell peppers in this recipe. The other ingredients were ingredients I had lying around in the pantry. To start things off, I diced the onions and sliced the peppers into strips. Then I tossed them in the pan with some melted butter and canola oil. When the beef was browned, I added the tomatoes and the chicken stock. Next, I stirred in the spices and the garlic. The spice combination I used made this dish taste a lot like Sloppy Joes, and those are my favorite dish so I wasn’t too disappointed. Because my beans were from a can and not cooked, I stirred them into the chili and covered the pan to cook for 20 minutes. This pan is so large, the only way to cover it is to flip the pizza pan upside down and put it on top of the pan. This is the same pizza pan I used to transport 16-4: Blueberry Pie. Served with a big dollop of sour cream and a tortilla chip, this chili was delicious. 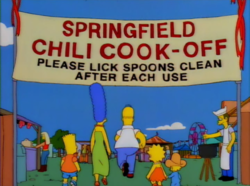 It was hardly spicy, it was crying out for more chili pepper. 🌶 IN YOUR FACE, SPACE COYOTE!